Duluth, Minnesota (OpEdNews) April 11, 2019: Retired Pope Benedict XVI, who will turn 92 on April 16, 2019, is back in the news for what he himself styles "some notes" he prepared to be published in a German-language monthly journal for clergy in Bavaria the part of Germany that he comes from. Born Joseph Aloisius Ratzinger on April 16, 1927, in Marktl, Bavaria, Germany, he was ordained a priest on June 29, 1951. Later, as a young professor of theology, he served as a theological consultant at the Second Vatican Council (1962-1965) in the Roman Catholic Church. Among Roman Catholic theologians at Vatican II, Fr. Ratzinger was known as a reformist a liberal. In his own later estimate, he did not subsequently change his views of the reforms instituted by Vatican II. In any event, Fr. Ratzinger was subsequently appointed Archbishop of Munich and Freising on March 24, 1977. On June 27, 1977, he was created a cardinal by Pope Paul VI. On November 25, 1981, Pope John-Paul II named Cardinal Ratzinger the prefect of the Sacred Congregation for the Doctrine and Faith a post he held until 2005. On April 19, 2005, Cardinal Ratzinger was elected the new pope. 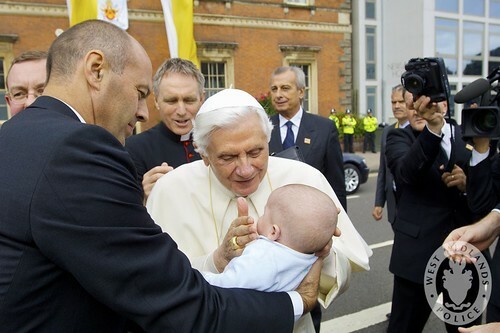 He chose the name Benedict XVI. He retired in 2013. Cardinal Jorge Mario Bergoglio of Argentina was then elected the new pope, and he chose the name Francis in honor of St. Francis of Assisi. Not surprisingly, Benedict reiterates rubbish that he has been saying for years about a supposedly "egregious event" that occurred in the 1960s, which at times he refers to as "the Revolution of 1968." For a secular account of the events of 1968, see Mark Kurlansky's book 1968: The Year That Rocked the World (New York: Ballantine Books, 2004). In her article, Glatz makes the following statement: "In an extensive study on the causes and context of the abuse of minors by priests in the United States from 1950-2010, the John Jay College of Criminal Justice of the City University of New York found 'the majority of abusers (70 percent) were ordained prior to the 1970s,' and 44 percent of those accused entered the priesthood before 1960.'" Granted, the priest-perpetrators may have had their Catholic thought-world rocked by the events of the 1960s as Benedict's Catholic thought-world was evidently rocked by the event of the 1960s. However, it strikes me that the priest-perpetrators may have had their customary pre-Vatican II Catholic thought-world rocked by Vatican II and its reforms. Of course, these two possibilities are not mutually exclusive. But the difference is that Benedict makes the 1960s a scapegoat, instead of including the reforms of Vatican II as another possible contributing factor. But recognizing and acknowledging that the reforms of Vatican II may have rocked the customary pre-Vatican II Catholic thought-world of certain priests who became perpetrators and thereby contributed to their destructive behavior might make Benedict uncomfortable. Why? Because we would then turn our attention to analyzing how the customary pre-Vatican II Catholic thought-world may have been rocked by the reforms of Vatican II. However, to his credit, Benedict recognizes that pedophilia is evil and destructive of the victims. He says, "Why did pedophilia reach such proportions [in the church]? Ultimately, the reason is the absence of God." Fine. But note that we are talking about priest-perpetrators experiencing the absence of God when they become abusive and destructive. However, Benedict does not dwell on the absence of God in the priest-perpetrators, except to note it. Instead of dwelling on the priest-perpetrators, Benedict changes the subject and launches himself on a lament about how the sacrament of the Eucharist is "devalued into a mere ceremonial gesture" that is supposedly "offered at family celebrations or on occasions such as weddings and funerals to all those invited for family reasons." But let's turn Benedict's language on the priest-perpetrators. As celebrants of the sacrament of the Eucharist, the priest-perpetrators "devalued [it] into a mere ceremonial." As celebrants, the priest-perpetrators were experiencing the absence of God not the presence of God. In other words, priest-celebrants most likely need to be experiencing the presence of God to evoke the congregants' experiencing of the presence of God.